Who Put the Peanuts in the Park? 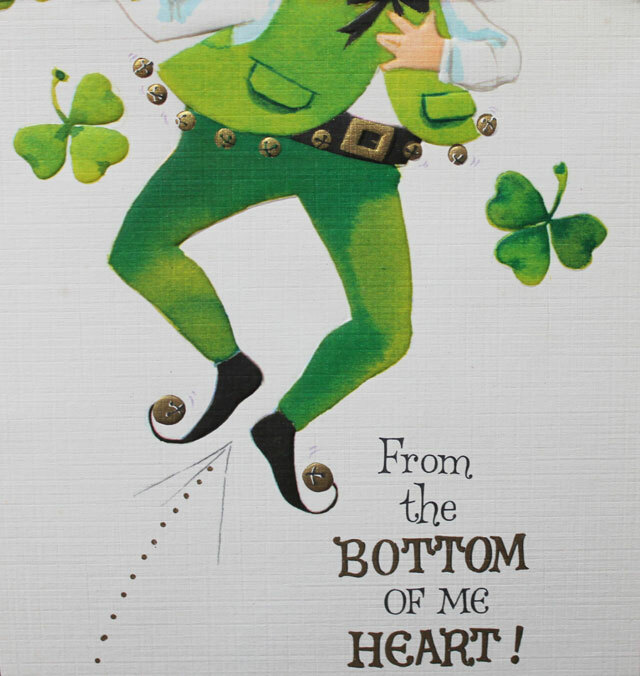 I received this interesting old St. Patrick's Day card in a mixed lot of vintage greeting cards that I bought off ebay once. 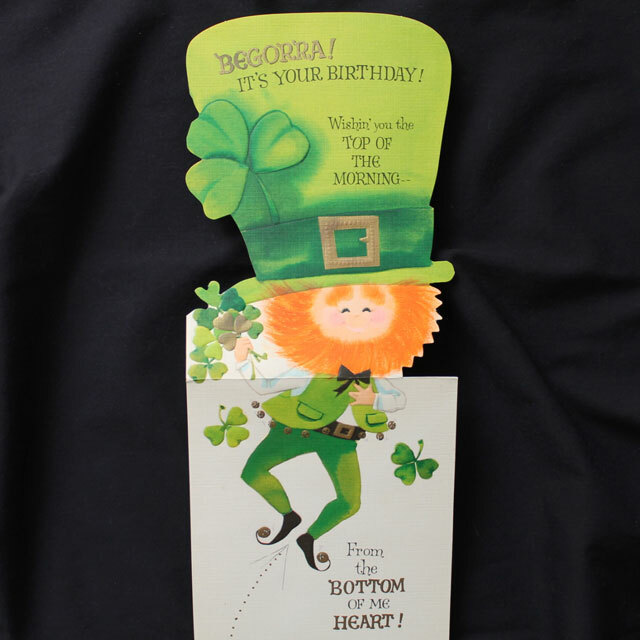 I think it is probably pretty rare because not only is is a St. Paddy's card, it is also a birthday card. Pretty specific, to make a birthday card for a particular day of the year. Further research proves that the card had to have been made more recently than 1949 though, as that was the year that Hallmark first introduced the 5 pointed crown symbol as their logo, which is included on my card. So I am led to conclude that this card was made during the 9 year period from 1949 and 1958. Given the somewhat modern looking imagery on the card I'd say it was towards the end of that period, so probably in 1958, making it at least 56 years old now. 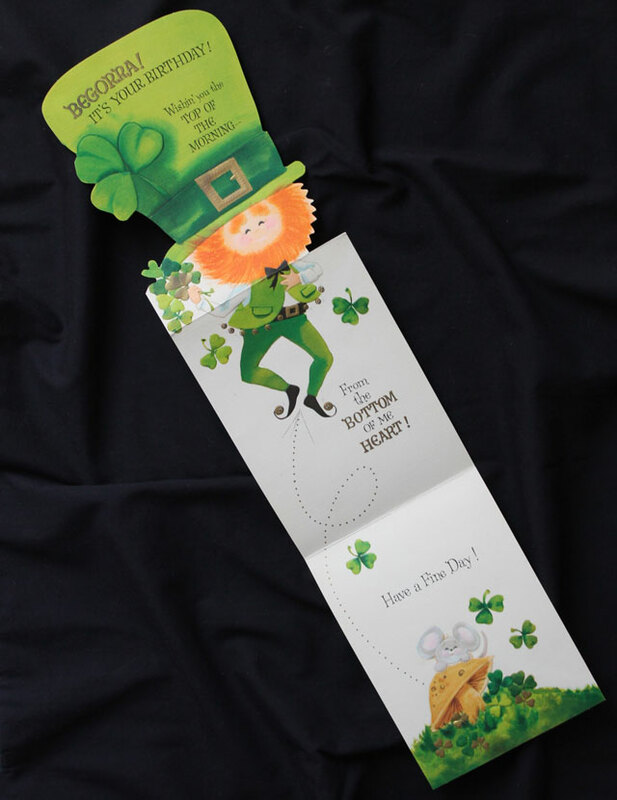 The fact that the card remains clean to this day (without any writing on it and never having been given to anyone) indicates that there wasn't much call for a St. Patrick's Day Birthday Card. Oh yes, and I looked up the word 'Begorrah' : Irish — used as a mild usually jocular oath. Euphemism for 'By God'. First Known Use: 1715 [according to Merriam Webster]. Thanks for taking a look. I hope you have a good St. Patrick's Day if it's a thing where you live. Here in Toronto lots of people were out celebrating on Saturday night, as we saw groups of them wearing green hats and shamrocks and stuff on the streets on Saturday night. But we don't really do much for it, although when I was working out of the house, I did used to wear something green and this little leprechaun pin that I've had since I was a kid. I have no plans today, but if I go out I'll wear that pin on my lapel because it's pretty cute, and the scarf and purse also shown in that post. How about you? Are you wearing green today? that is such an adorable card! I don’t know anyone with a st. Patrick’s day birthday, but there’s got to be at least of few of them out there. I wonder if there was a whole section of hybrid birthday-on-an-occasion cards, like happy new years and birthday cards! Two of my Facebook friends had a birthday today! That is a cute card and in such lovely condition for its age. I suppose it’s not for sale??!! My sister Sarah has her birthday on St Patrick’s Day and we always have to buy her 2 cards (1 for the birthday and 1 for St Pat ‘s.). We are half Irish as our mother is a Kerry lass!! 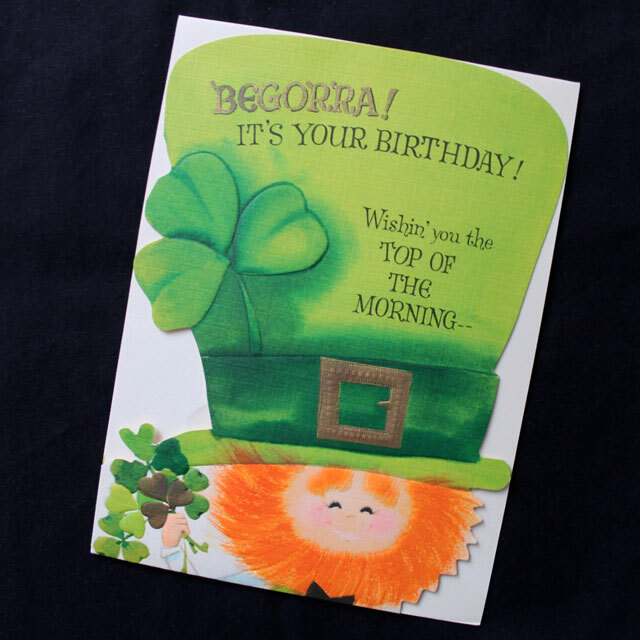 It would be great if I could find St pat’s/birthday cards in one! ‘Tis a lovely card, to be sure!! 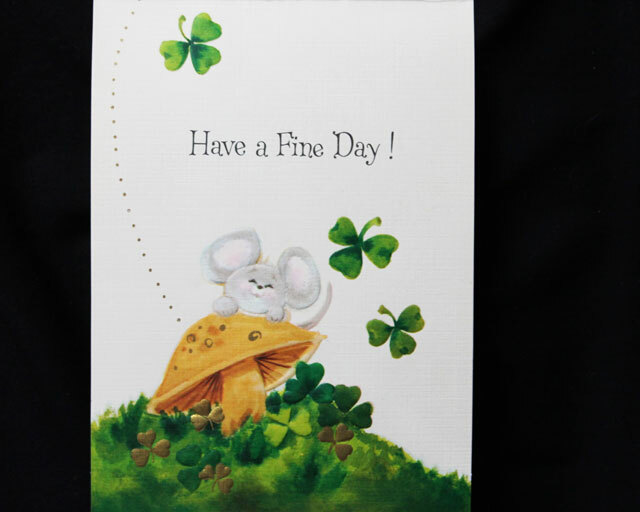 I’m sorry Louise, but I won’t be selling it, as I’m an avid collector of vintage greeting cards, and this is the only St. Patrick’s Day one I’ve ever come across. 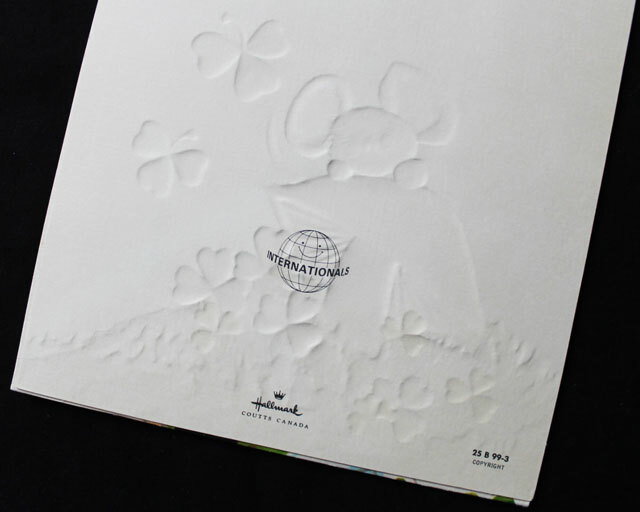 I hear what you’re saying though … it would be great if you could get send her two wishes with one greeting card! I have a close relative whose birthday is on Valentine’s Day, and although I have a vintage card that specifically says ‘For your Valentine’s Day Birthday’, I’ve never had the heart to part with the card and send it to her.